In 2012 artist Kathy Krisinski attended a house concert at the popular Abbie Weisenbloom series in Portland, Oregon. Jack Dwyer, Tim Connell and Marijke Wiesenekker were playing mandolin along with Michiel Wiesenekker on guitar. It was not only a full moon that night, but a blue moon. 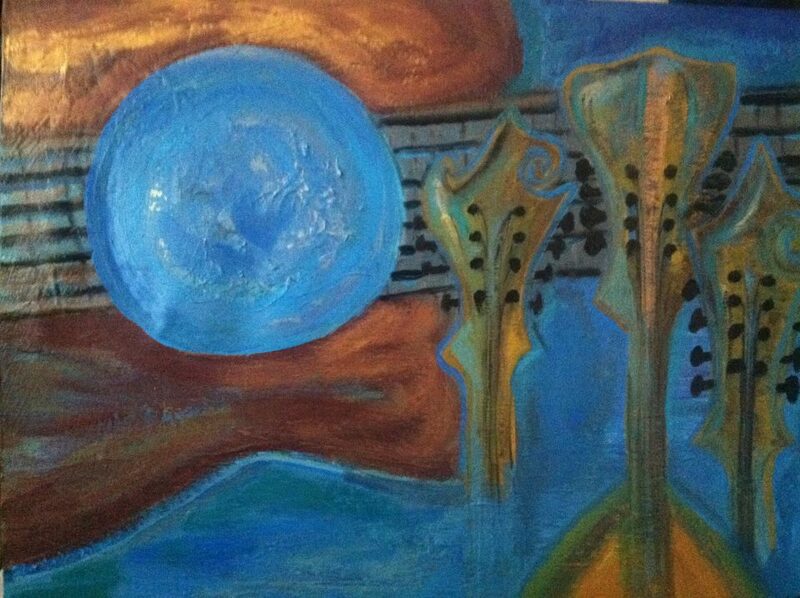 Following the show the musicians jammed together until 2 a.m. and the good energy from the evening inspired Kathy to paint the blue moon guitar and 3 mandolins painting that sold to someone in Germany. Though it won’t be a full moon on the 28th, Mando Plant featuring Jack Dywer and Tim Connell will be bringing that same energy to Chestnut House Concerts on Friday, March 28th. Potluck is at 6:00 pm and the show begins at 7:00 pm. Donations of $15/20 at the door. Paints, brushes and easels optional. This entry was posted in Upcoming House Concert and tagged Abbie Weisenbloom, Blue Moon, Jack Dwyer, Kathy Krisinski, Mando Planet, Marijke Wiesenekker, Michiel Wiesenekker, Portland Oregon, Tim Connell by chestnuthouseconcerts. Bookmark the permalink.